I began “Day 2”of my summer vacation with a paddle on the Blackwater River in Milton, Florida. I rented a sit-on-top kayak from the Blackwater Canoe Rental and selected the 11-mile paddle from the Bryant Bridge (north of Milton) to Deaton Bridge. The outfitter dropped me at 9:30 a.m. along with three folks from Alabama. Boning claims that the Blackwater is among the most pristine of Florida’s rivers. Blackwater comes from the Choctaw word “Oka Lusa” which means “water black.” At lower levels, the river is tannin-colored (rusty looking in the lowest spots) but turns black at deeper levels. 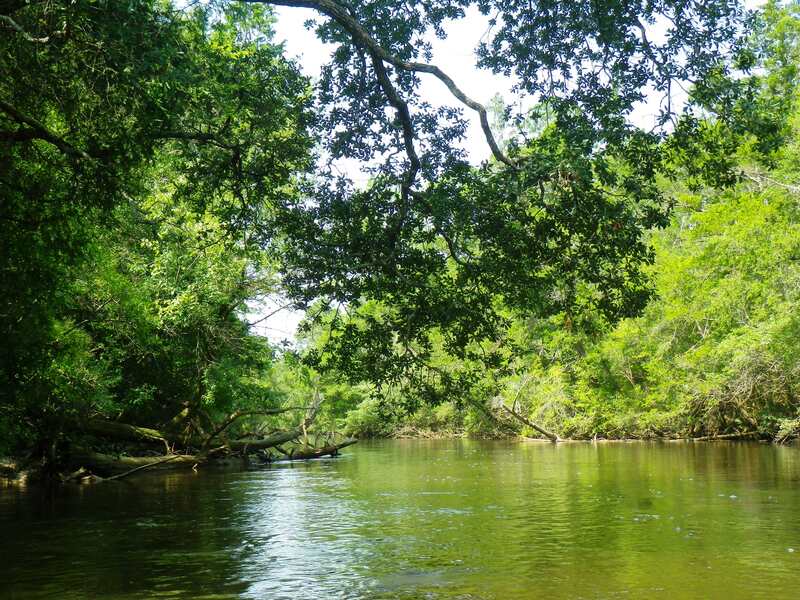 The Blackwater River begins its journey in the Conecuh National Forest in Southern Alabama. It flows about 56 miles south, then west, on its way to the Blackwater Bay. When it reaches Florida, it passes through the Blackwater River State Forest. 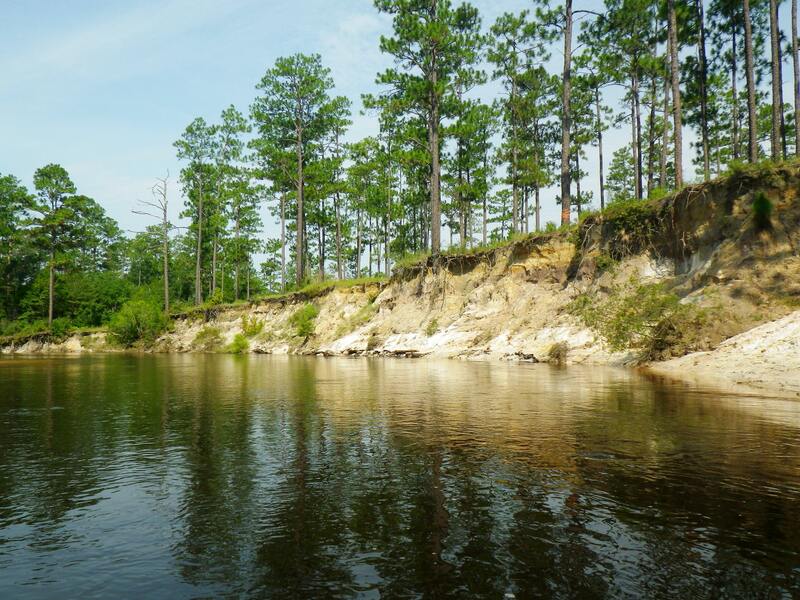 The Blackwater River is an Outstanding Florida Water; thirty-one miles are Designated Florida Paddling Trail as well. So, I paddled away on the tannin-colored water under clear, sunny sky, waving goodbye to the folks from Alabama who had been nice enough to invite me to join them. I took in the scenery and sighed—to my right, a high sandy bank, etched throughout the years by the twists and turns of the river, topped by tall, straight pines. For over two hours, I paddled in silence, little sign of life. A couple lazy hawks flew overhead, and then I saw low-flying aircraft from the nearby Eglin Airforce Base—a strange reality check. Briefly, my mind flitted to a scene from the African Queen, but then they were gone, and I melted back into my seat and took in my surroundings: white cedar, cypress, water oak, pine, wax myrtle, and magnolia. The river offered an occasional shady spot and a light breeze, only minimal relief from the sun. The sides of the river alternated with white sandbars on one side and sandy banks on the other—similar to the Perdido. High waters and storms had scooped out the banks, leaving tree roots exposed. A sandbar beckoned me; I stopped for a quick stretch and a dip to cool off. About 2.5 hours into my paddle, tubers appeared in their blue, green, pink, and yellow tubes, decorating the white sandbars like sprinkles on a cake. My spiritual retreat ended, as I paddled past wading sunbathers and sandbars adorned with umbrellas and coolers. Teenagers stood on high banks while from the water below, others dared them to jump. I couldn’t watch. Four hours after my put in, I passed under the Deaton Bridge, and pulled my kayak out of the water. My outfitter connection awaited me there.